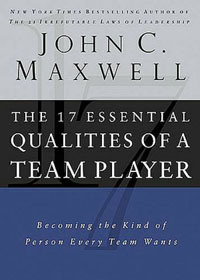 Adding Value To Teammates Is Invaluable to leadership development in the Church. Team members love and admire someone who is able to help them move to another level, someone who enlarges them and empowers them to be successful. "The purpose of life is not to win. The purpose of life is to grow and to share. When you come to look back on all that you have done in life, you will get more satisfaction from the pleasure you have brought to other people's lives than you will from the times that you outdid and defeated them" (Rabbi Harold Kushner). "Most of us plateau when we lose the tension between where we are and where we ought to be" (John Gardiner). Team members appreciate and admire people who are able to help them go to a new level, that is, people who enlarge them and empower them to be successful. Enlarging is about adding value to your teammates. As Bill Russell stated, "The most important measure of how good a game I played was how much better I'd made my teammates played." People who enlarge their teammates have several practices in common. Charles Schwab summed it up when he said, "I have yet to find the man, however exalted his station, who did not do better work and put forth greater effort under a spirit of approval than a under a spirit of criticism." To add value to your teammates, you need to believe in them. Their performance will reflect the expectations of those they respect. To add value to your teammates, you need to understand what they value. Enlargers listen and discover what their teammates say and do. They gain knowledge and relate and this creates a strong connection with teammates. Relationship is an important ingredient in team building. And it is this relationship that is the conduit to adding value to your teammates. Adding value is really the essence of enlarging your teammates. It is discovering ways to help others to improve their abilities and attitudes. People who have this ability to enlarge others look for the gifts, talents and uniqueness in other people in order to help them to take those abilities to a whole new level. As the old saying goes, "You cannot give what you do not have." Therefore, people who have the ability to add value to others are people who are developing themselves. So if you want to increase the ability of a teammate, then you need to be making yourself better. When it comes to adding value to your teammates, keep these principles in mind. Believe in others before they believe in you. In other words, if you want to add value to your teammates, then you need to take the initiative. Serve others before they serve you. Adding value to your teammates requires a servant heart. Add value to others before they add value to you. "A basic truth of life is that people will always move toward anyone who increases them and away from others who devalue them." For more information about this subject, click on adding value to teammates is invaluable.